• Choose your recipes and make a shopping list, then check it twice. Nothing is more frustrating than being halfway through a recipe only to discover you don’t have an ingredient. • Don’t be afraid to make a suitable substitute. Use walnuts instead of pecans, raisins instead of currants, and margarine instead of butter (except shortbread). 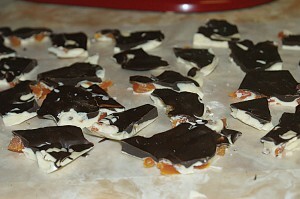 Items that are hard to make substitutes for are eggs, corn syrup, and chocolate bark. • Once the oven is preheated, I like to keep it filled at all times. It is ideal to have at least two cookie makers in the baking party. When one tray comes out of the oven with a fresh batch of baked goodies, another tray is ready to be popped in so no energy is wasted with the oven running empty (which is why you should have at least two baking sheets for rotating). If you only have one rolling pin, stagger the recipes so one baker is making a drop cookie while the other is making a cut-out cookie. • Assemble all ingredients before starting rather than digging through the cupboards for staples. I like to set out the flour, sugar, baking powder, soda, spices, butter, margarine, dried fruits, nuts, chocolate, and other ingredients where they are within easy reach. • Have some storage containers handy such as plastic food containers or food-safe tins for packaging the cooled cookies in. 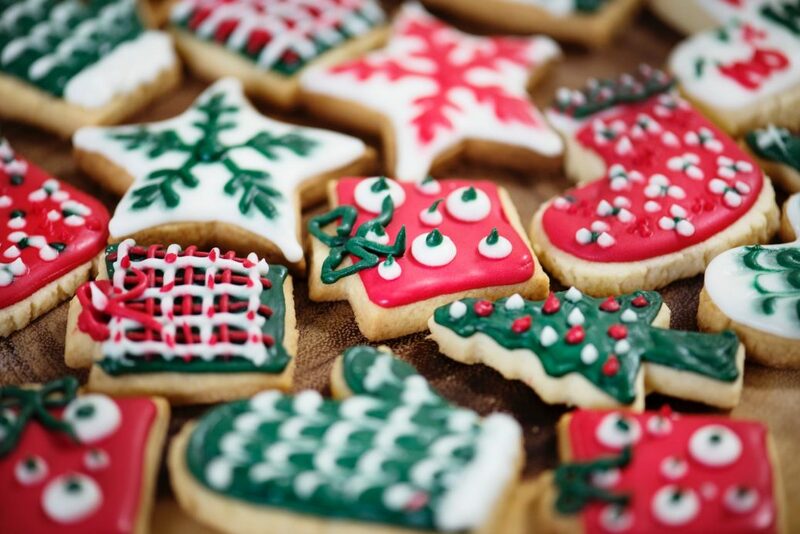 Once packaged, cookies can be stored in a cool dry place or frozen for safekeeping. A little trick I like to do is buy fancy plastic Christmas-patterned platters (available at dollar stores) and load them up with an assortment of cookies ready for serving when company drops by. Load the platters, cover with plastic wrap, and freeze. They only take about 10 to 15 minutes to thaw, which gives you just enough time to whip up a punchbowl of homemade eggnog or heat some mulled wine to serve your holiday visitors. The first things up on my baking list are fruitcakes, since they need at least 4 to 6 weeks to mature into delectably moist, mellow cakes that slice like a dream. Making them well in advance gives plenty of opportunity to sprinkle them every so often with brandy or rum, which draws out the flavors of the fruits. And since I like to send fruitcakes to loved ones who live too far away to visit over the holidays, this allows plenty of time to have them wrapped and ready to mail in time for Christmas. 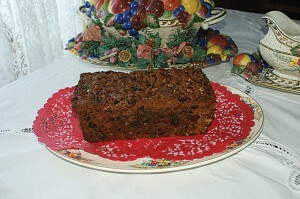 Mom’s old recipe makes a wonderful, dark, rich fruitcake. Her recipe makes about 8 pounds of cake. I like to bake the cakes in various sized tins (large, medium, and small) — the smaller ones make great gifts for single folks, the larger ones for families. If this batch is too big, you can easily cut the recipe down to suit your needs. Prepare pans by greasing with butter or shortening, then set aside. ¼ cup (more or less) spiced brandy or rum. Grand Marnier gives rich fruity flavor. Put brown sugar into a large mixing bowl. Add butter and beat until fluffy. Add egg yolks and beat until light and creamy. In a separate bowl, mix 3 cups flour with spices and baking soda. In another bowl, combine cherry juice, molasses, and water. Add flour mixture to butter mixture, and blend alternately with the liquid mixture. Measure fruits, nuts, candied peels, and cherries into a large bowl; moisten well with brandy or rum. Sprinkle with ½ cup flour (or more) until each piece is coated. Fold fruits and nuts into batter. Beat egg whites until stiff, then gently fold into the batter. Spoon batter into prepared pans. Stagger loaves in preheated 300° F oven. Bake 3 to 6 hours, depending on size of loaves. Remove smaller loaves first and leave the larger ones until a toothpick inserted in center comes out clean. Cool on rack before turning out of pans. Brush the cakes liberally with spiced rum or brandy. Wrap in waxed paper or foil and store in a cool place — re-brushing with rum or brandy about once a week or more depending on desired moistness. Mom baked her fruitcakes in a woodstove oven and she’d put a shallow pan of water on the bottom rack to keep moisture in the oven during baking. I use an electric oven, and even though this step could be eliminated with a modern range, I still practice it. I use a large cast iron skillet to hold the water. These are the prettiest cookies on any platter and so easy to make! 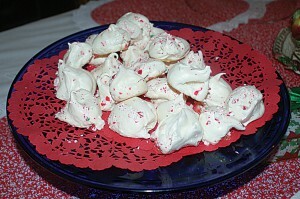 It’s a good idea to do meringues at the end of the baking day as they need to dry in the oven overnight. Put candy canes in a plastic bag and crush with a mallet into fine pieces. Set aside. Preheat oven to 200° F. Line a baking sheet with aluminum foil. In large bowl of electric mixer, beat egg whites on medium speed until foamy. Sprinkle with cream of tartar and continue beating until soft peaks are formed. Add sugar, a bit at a time, and continue beating until meringue holds a stiff peak. Beat in vanilla. Drop by teaspoonful onto the baking sheet leaving a little space between each meringue. Sprinkle with the crushed candy canes. Bake 1½ hours. 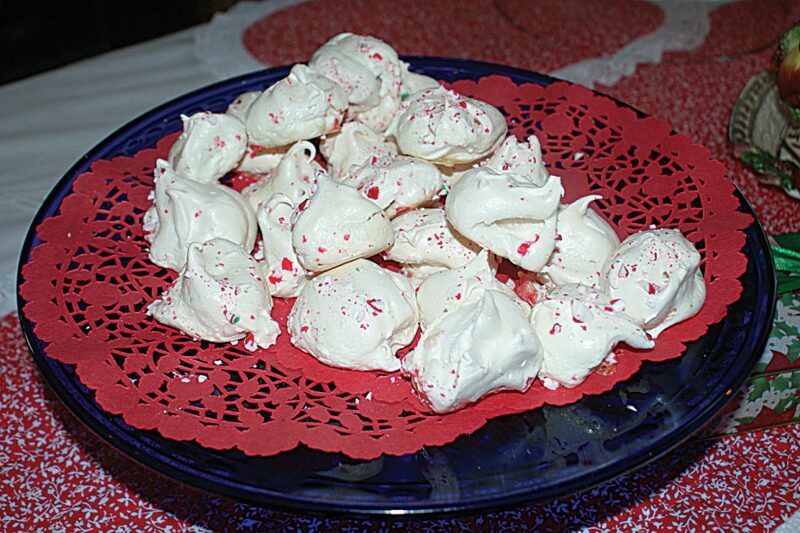 Turn off oven and leave meringues in oven overnight or until completely cool. My aunt made the best shortbread cookies ever. I think it’s the touch of nutmeg that adds a little magic. 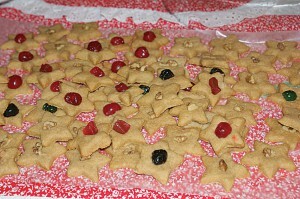 Or maybe it’s the piece of walnut or candied red or green cherry half that tops each cookie. I make mine from her old recipe. Makes 3 to 4 dozen, depending on size of cookie cutter used. Soften butter by working it in a bowl with a wooden spoon. Stir in sugar, salt, nutmeg, egg yolk, and extract. Add flour, a little at a time, until mixture is too stiff to work with a spoon. Turn onto floured board and knead lightly, drawing in all the flour until the dough begins to crack. Roll out to ¼-inch thick and cut into stars or other desired shapes. Place on an ungreased cookie sheet. 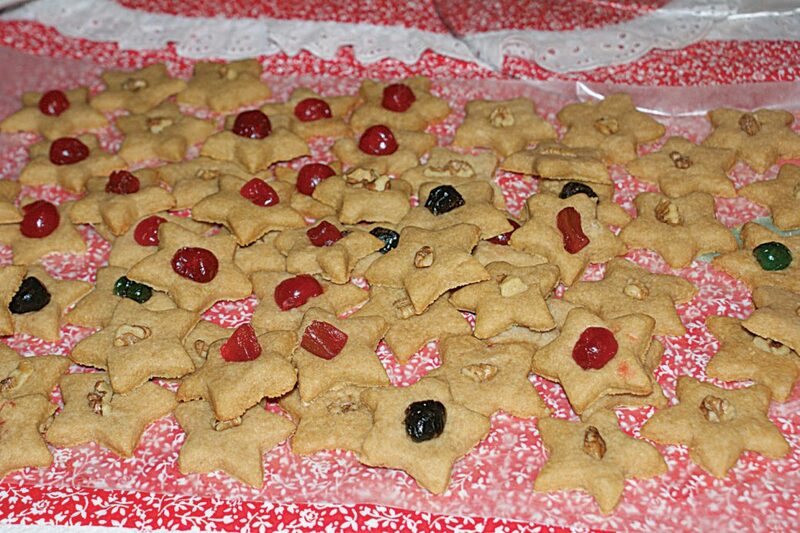 Top each cookie with a piece of walnut or half a maraschino cherry. Bake at 350° F for 10 minutes or until lightly tanned. These cookies can be men, women, stockings, canes, snowmen, stars, bells, trees, snowflakes, or whatever your heart desires. Makes about 3 to 4 dozen, depending on size of cutter. If you have little hands in your baking party, they will love decorating these fragrant cookies. Have lots of icing, sprinkles, and candies ready for them to work with when cookies have completely cooled. Cream shortening. Heat molasses to boiling. Cool and pour over shortening, mix well. Combine dry ingredients and blend into molasses mixture. Put in fridge and chill 1 hour. Roll dough ¼-inch thick on lightly-floured surface. Cut with cookie cutter into desired shapes. Place on ungreased baking sheet and bake preheated 375° F oven for 5 to 7 minutes or until browned. When I was a kid, Mom used to joke that it was impossible to steal a thumbprint because you’d get caught every time… But that didn’t stop me from trying to sneak these tasty, pretty cookies off the platter when nobody was looking! I still love them today. Makes 2 dozen. I use assorted homemade jams with one of my favorites being raspberry. Preheat oven to 350° F. Grease cookie sheet. Using a wooden spoon, cream butter, sugar, egg yolk, and extract. Add flour and mix well. In a small flat bowl, beat egg white lightly with a fork. Form dough into walnut-sized balls, roll in egg white, then in walnuts. Place on cookie sheet about 2 inches apart and bake 5 minutes. Remove from oven. Using your thumb, make a dent into each cookie and fill the space with a dollop of jam. Return to oven and bake 8 to 10 minutes. 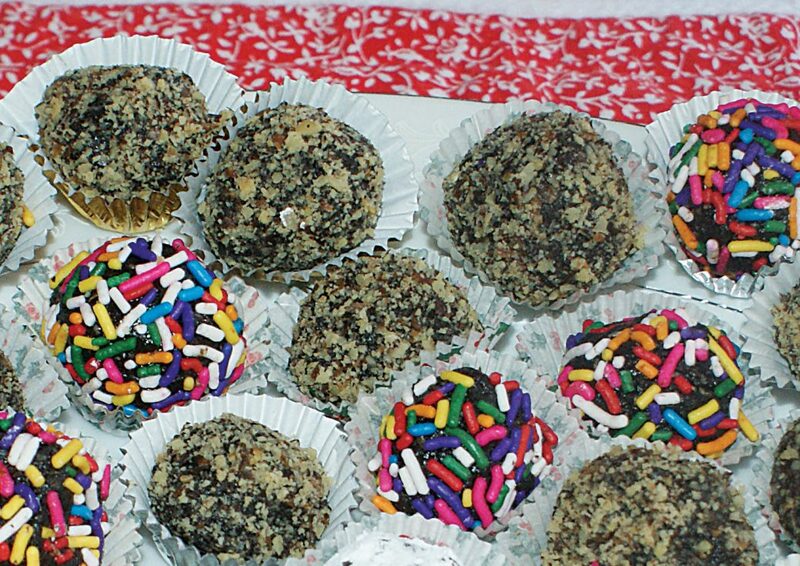 Rum balls are always a big hit. A cross between a cookie and a candy — these are always a big hit with the chocolate lovers! So colorful and pretty on the platter, especially when served in little foil cups. Makes about 2 dozen balls. Put chocolate in bowl and melt over hot water or in microwave. Add coffee granules, corn syrup, icing sugar, rum, crumbs, and nuts. Mix well. Cover and chill for 20 minutes. Shape into bite-sized balls and roll in desired coatings. Set in candy foil cups and store in a cool place. These are so easy to make — even the smallest hands can help with these fun cookies. Mix peanut butter, margarine (or butter), and sugars together into a large bowl. Work in the cereal and peanuts, adding more cereal if mixture is too wet or more peanut butter if mixture is too dry. Chill in fridge for 1 hour. 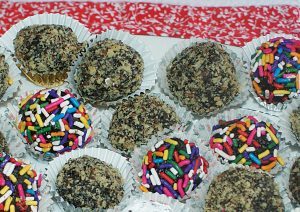 Form into 1-inch balls and roll in chopped nuts, icing sugar, dried coconut, or sprinkles. Grandma always made sugar cookies for Christmas and there was nothing I enjoyed more than helping her decorate them with vanilla frosting and silver bells. Makes 2 to 3 dozen cookies, depending on shapes. Mix dry ingredients. In a separate bowl, cream butter with sugar, add egg yolk and mix well. Combine dry ingredients alternately with the milk, add extract. Mix well. Form into a ball and chill. Roll to ¼-inch thick on a lightly-floured surface. Cut with cookie cutters into desired shapes. Place on ungreased baking sheet and bake 375° F for 10 minutes. Cool before frosting. Here is an easy-to-make frosting for decorating your cookies. It can be tinted with food coloring, if desired. Cream butter. Gradually add icing sugar alternately with milk and extract until it reaches spreading consistency. 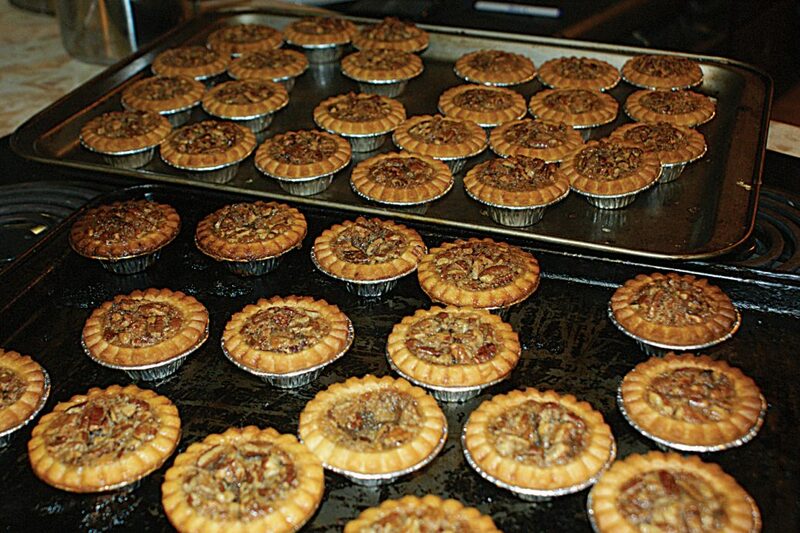 My daughter, Lana, loves pecan tarts and nobody makes them better! You can use homemade pastry or petite ready-made tart shells. Makes about 2 dozen mini tartlets. Mix corn syrup, sugar, butter, and vanilla in large bowl. Add eggs and blend well. Stir in the pecans. Spoon into shells. Bake in a 400° F oven for 15 minutes or until mixture bubbles up “like a tent,” as Lana would say. This is so good, you really can’t stop at just one nibble! 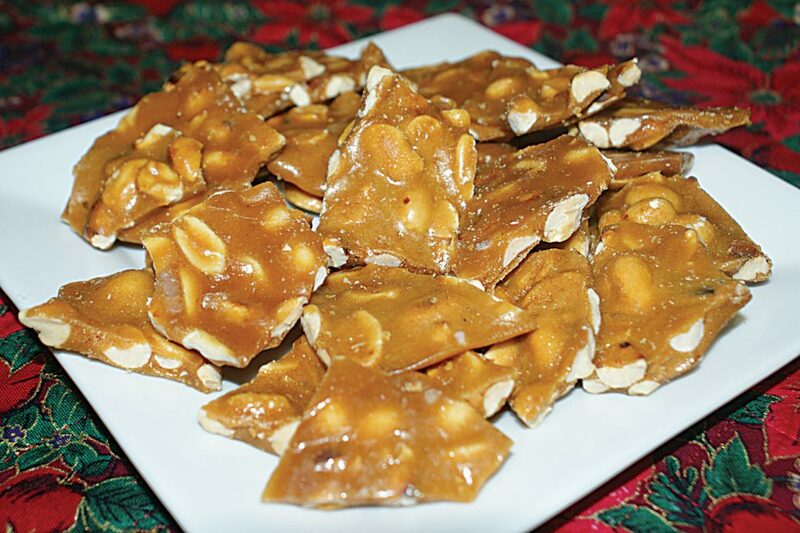 Make lots of this candy because it makes an excellent last-minute present or hostess gift. Buy the chocolate and apricots in bulk for great savings. Line a baking sheet or dish with waxed paper. Set aside. Melt white chocolate in double boiler, adding a few pieces at a time until all is melted. Stir until smooth and hold warm. Now melt the dark chocolate in the same fashion. Pour the white chocolate on the prepared pan and spread out evenly into about an 8-inch square. Sprinkle the chopped apricots over the white chocolate and then drizzle the dark chocolate over top, smoothing it into an even layer. Set in cool place to harden. Break into pieces before serving. Peanut brittle can be made with other nuts too. Try using more exotic nuts in place of peanuts — walnuts, almonds, pecans, Brazil nuts, hazelnuts, or a mixture of nuts. Grease a large baking sheet with butter, set aside. In a deep heavy saucepan, bring sugar, syrup, salt, and water to a boil over medium heat, stirring until sugar is dissolved. Stir in peanuts. Cook until candy reaches the brittle stage (a tiny ball dropped into cold water will turn into a brittle thread). Remove from heat. Stir in butter and soda. Pour quickly onto prepared pan, using two forks to pull and spread it out thinly. Set in cold place to cool; I like to set mine on the deck in the snow to harden. Break into pieces.